Offering you a complete choice of products which include printed appalam, printed applam papad and printed papads. 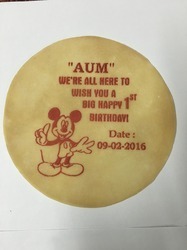 Our special innovation Printed Appalam for your memorable movements. 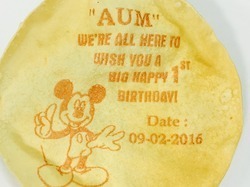 Printed Appalam are mainly served in special occasions like marriage, birthday, naming ceremony, house warming, etc. 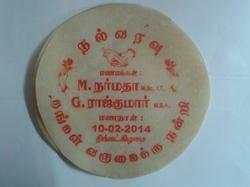 We are engaged in making special Printed Appalam Papad for various events. We use edible food colours for printing of Applam. Our special innovation, Printed Papads/appalam, poppadum for your memorable movements. Printed Appalam is mainly served on special occasions like marriage, birthday, naming ceremony etc.